There are many different accessories you can purchase for your Pontoon Boat. Not everyone wants their boat to be the same as everyone else’s. Using accessories, you can customize your boat to suit your preferences. Customizing your boat is the best way to make it yours. In this article I’ll be recommended some of the best pontoon boat accessories. Most of these accessories can be purchased from Amazon. I had already touched on a few of these accessories in my article on the cost of a pontoon boat. However, here I’ll be recommending a few more and explaining why you need them in more detail. Ski Ladders are a pontoon boat essential. You’ll need to have one installed onto your boat so that you can climb back on if you fall into the water. 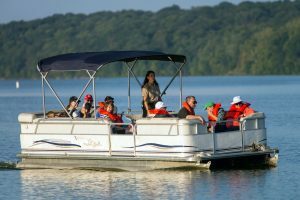 If you plan to use your pontoon boat for watersport activities or anything which will require you having to climb into your boat from the water often. Ski Tow Bars are a bare which is installed onto the back of a boat so that a tow rope can be attached. Most pontoon boats will have a tow bar pre-installed however not all do and when they do, the bar is not always the best quality. Therefore, I’d highly recommend purchasing a tow bar. A ski tow bar which I could recommend for you is the TubroSwing Ski Tow Bar. This is an extremely high-quality tow-bar which elevates the tow robe above the wake. Doing so provides a smooth and consistent pull. This is probably one of the best ski tow bars on the market currently. An emergency light is an important accessory for any type of boat. If there’s a chance that you may be on the water whilst its dark, then an emergency light is essential equipment. An emergency light will allow you to safely navigate around in the dark. I’d highly recommend that you purchase on even if you don’t think you’ll be out when it gets dark. You never know when you lose track of time or something causes you to stay out a little later than planned. It’s always better to be safe than sorry. This inexpensive little gadget could save your life. I’d recommend this Waypoint Spotlight. This is a high-performance pistol-grip spotlight which allow you to navigate in the dark. With different modes you can adjust the intensity. With a stream light-engineered reflector, intense beams are produced which slice through the darkness. If you want to ensure that your pontoon boat has a long life-span and stays in good condition, you should install corner bumpers. When docking your boat, it is very likely that your boat may hit against the dock – damaging the corners. This happens very often, and the damage may seem minimal but over-time this re-occurrence can cause significant damage. There are many different products manufactured to fix this problem however I’d recommend these corner bumpers. These rubber corner protectors mount to the original factory corners and absorb the force of any collisions. No matter what boat you get, you’ll need to purchase a boat cover for it. You may not think it; however, boat covers can drastically increase the life span of your boat. Pontoon boats are not cheap, therefore it’s important for you to keep it safe and protected. Without the boat cover, your boat will be exposed to the elements of the weather. Even if your boat is under shelter, insects and rodents could still damage your boat without a cover. A diving board isn’t an essential pontoon boat accessory however it can be a ton of fun. Most people won’t need one however those who know how to have a good time will love it. Though somewhat expensive, it can last you a long time if used appropriately. The diving board I’ve recommended is very durable and high quality. I’d recommend this diving board by Lilipad. What’s better than enjoying a boat grilled meal whilst on the water? Imagine enjoying a day out on the water with your friends and/or family, having a few drinks and sizzling some burgers on the barbeque. It would truly be an amazing experience. For this to work, you’ll firstly need to purchase grill mounts for your pontoon boat. There are many different barbecue grill mounts on the market which you could purchase to accommodate for your barbecue. I’d recommend Arnall’s Grill Bracket Set. This set will be compatible with most boat grills. If you haven’t go neither a grill or a bracket set yet, I’d highly recommend you get this bundle. I have an article in which I review the top 5 best pontoon boat grills on the market. I’d highly recommend that you have a read of it, if you’re planning to purchase a grill for your pontoon boat. Want to turn your pontoon boat into something amazing? This is the accessory for you. Under-deck lighting looks amazing in the dark. Your pontoon boat will glow and stand out for sure! In my opinion, this is one of the best ways you can customize your boat to your preference. If you plan to throw small parties on your boat or just want to have a great time, I’d highly suggest you invest in some under deck lighting. There are some stunning under deck LED lights on Amazon. I’d highly recommend you purchase these lights. They look amazing and are manufactured specifically for pontoon boats. Just ensure you have the correct size and installing them should be easy. Once purchased, just follow the instruction that come with the lights and you’ll have everything set-up in an instance! These LED’s will illuminate the water at night, making for a beautiful sight. LED’s use very little power and with a lifespan of over 50,000+ hours, they will last you a long time. Though the lights that I’ve recommended are blue, you can do some digging online and find them in any preferred color. Wherever you travel, you’re likely to have your phone with you. This is no expectation from when you’re boating. This is when you’re most likely to get your phone wet or even drop it into the water. And as everyone knows, electronic devices and the water don’t work very well together. Because of this, I’d highly recommend that you purchase a dry case. These are very inexpensive cases which you put your phone into. The case should protect it from any damage, meaning that if an accident was to occur, your phone will survive. I use this dry case from Amazon. This is a great case as you can use your phone through the case. This means that you’ll have full functionality of your phone without having to worry about it sustaining any water damage. This case also has an adjustable neck lanyard which should prevent you from dropping it into the water. This case is large enough to accommodate for most phones, and you may even be able to fit other things inside such as a passport or important notes. When traveling in a boat, it’s always a good idea to ensure that you have optimal clothing and equipment. This includes boat shoes. Shoes which are designed for boating are often great purchases as they can significantly improve your boating experience. Adidas have some great boat shoes which are built with quick dry materials. These shoes have great drainage so that your feet are not soaked for extended periods of time. These shoes also have great grip and increased friction to prevent you from slipping. Therefore, these shoes will improve safety and reduce the chances of injury. When using your boat for fishing, I feel as though rod holders are essential. This is especially true if you’re fishing with kids who don’t have the patients or strength to hold a rod out for hours. These rod holders are amazingly effective products which come at a cheap price. For a pontoon boat you’ll want to get these rod holders. They are to be mounted on the rail of the boat. Though the rod holder is cheap, it’s not made from cheap plastic. This rail-mount rod holder is built from a very strong metal, meaning it could last you a long time if used appropriately. Vinyl flooring is a slip resistant textured surface which is to be installed onto the floor of your pontoon boat. Though this upgrade is costly, it will improve the quality of your boat significantly. I’d recommend you purchase MariDeck Marine Vinyl Flooring. This is a very high-quality product which you can purchase from Amazon for a very cheap price. This flooring is slip resistant which makes it perfect for your boat, there’s nothing worse than falling over on your boat and injuring yourself. Marine Vinyl Flooring is available in a wide range of different colors and sizes. A Bungee Dock Line could be very useful, allowing you to connect your boat to the dock quickly and securely. These products come at a very small price for the convenience they provide. Airheads Bungee Dock Line is built to absorb shock. Inside the rope, there is a hidden bungee cord which performance as a built-in snubber. There are many great accessories you can purchase for your Pontoon Boat. Some are essentials which you’ve more than likely require, whereas some will empower your boating experience however you can live without them. This list only consists of my favorite picks, however there are many more on the market. If feel as though I’ve left an important accessory off the list, or you have any further questions that’d you like me to answer. Feel free to leave me a comment below.